Multi-aged classrooms: Children are grouped in multi-age groups spanning two to three years. Multi-age classrooms serve to: encourage cooperation, minimize competition, provide opportunities for indirect learning for younger students as they observe older peers, foster self-confidence in students who serve as role models, and provide long-term child/adult relationships. Educational materials are concrete to aid the child to learn order, to discriminate physical dimensions, provide opportunities to teach responsibility, coordination, and interdependence, and to indirectly prepare for complex abstract concepts. Each child initially responds to an inner urge to develop both knowledge and build identity through spontaneous activity which charts the course for individualized lessons. Whole to part presentation of subjects. The universe is presented and then the details. Part to whole presentation of subjects. Details are presented based on graded curriculum and the universe is built detail by detail over a span of years. Purposeful and self-selected work provides internal self-discipline. Child discovers concepts through repetitive work with manipulative materials. Uninterrupted work time is designed into daily schedule to honor child’s individual focus and interests. Control of error lies in the material itself. Child’s own intelligence fosters correction. Self-perfection is a natural tendency of every child and the excitement of self-mastery and discovery motivates children to learn. Practical life skills are central to overall curriculum. Child can work where he or she is comfortable, moves around and talks at will (yet disturbs not the work of others). Organized program for parents to understand the Montessori philosophy and participate in the learning process. Teacher acts as guide and follows the child; child determines direction of learning by own interests. Teacher has central role in classroom activity; child receives direction from adult via predetermined activities. Discipline is external to child via the authority of the teacher. Instruction, both individual and group, is adapted to adult’s teaching style. Most lessons given in small to large groups. Orientation of work and classroom milieu determined and directed by the teacher. Textbooks and worksheets reinforce lessons given by the teacher. Instruction pace is usually set by group norm or teacher. Work is set up for a right and wrong answer. Teacher indicates errors. Learning is reinforced by external rewards such as grades, rewards, and verbal acknowledgements. Textbooks and worksheets provide the source of information. Child expected to have acquired self- care skills prior to entering school. Child assigned own chair and expected to spend most of school day stationary. Parent involvement central to assisting with social activities and field trips. 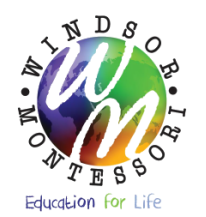 © Copyright 2014 - 2018 Windsor Montessori School, www.windsormontessorischool.com All rights reserved.